So you want to go to Eberron. What brings you to this world, weary traveler? What are your intentions in this land? Perhaps, you’ve seen the new release of a Wayfinder’s Guide to Eberron and wish to explore. Longtime Dungeons and Dragons players may remember the first mention of Eberron back in 3.5 edition from the Eberron Campaign Setting book. Apart from a few updates releases to adjust the setting to 4th and 5th edition, there has been a very little progression of Eberron "canon" ever since. That changed on July 23, when Wizards of the Coast released an official Wayfinder's Guide to Eberron pdf online. There have been a plethora of mixed reviews since ever since. Some players believed the choice of Eberron to be very random and unexpected. Other groups cherish the world of Eberron and were excited by the announcement of this long-awaited expansion. No one seemed more excited than staff members and players who closely follow Wizard of the Coast. One announcement stood out more than others, and that was an Instagram post from Satine Phoenix. Satine is a popular staff member of Wizards of the Coast and public voice within the community. In the image below, Satine shares an Instagram post congratulating a man named Keith. Her sincere happiness for the creator practically jumps from the page! In this Instagram post, Satine explains how happy she is for Keith and for this highly anticipated announcement. In the comments, you’ll find long-time players and new fans congratulating Keith. So who is this Keith, and why is Eberron so special to him? For any player wanting to better understand Eberron or a Dungeon Master (DM) in the process of worldbuilding, we suggest starting from very the beginning. Continue reading to discover the 3 things you should know before starting your next Eberron campaign. The deep lure, diverse worlds, and interactive campaigns set in Dungeons and Dragons are carefully sculpted by a strong creative team in Wizards of the Coast. To build relationships within the community, and to drive outreach, Wizards is known to host submission based contests. Wizards ran a popular submission based contest in 2002 searching for a new campaign setting, with the promise to publish the winner. Long-time fan Keith Baker submitted a (very cool) eye-catching world called Eberron, which you may have heard of by now. Keith won against 11,000 other submissions. At this point in his life, Keith was already working as a freelance writer for Atlas Games. With game designer experience already in his back pocket, he was granted the unique opportunity to work directly with Wizards of the Coast to create Eberron content. In 2004, Keith and his team won the Origins Award for Best Roleplaying Game Supplement for their work on Eberron Campaign Setting. Keith still works as a freelancer for Wizards of the Coast and has become a bit of a celebrity within the community. He has continued his career in game design, working with other large companies such as Paizo Publishing, Goodman Games, and Green Ronin Games. Now, Wizards is going back to Eberron with Keith on staff, and his story has gone full circle. This event is special because he first wrote for the company through this submission. Eberron was, in a very real sense, a passion project. D&D is a beautifully immersive game that allows for creative storytelling. It’s important to know where a story comes from, and what drives it, to better tell your story in-game. As a DM, it may be easier to research and immerse yourself in worldbuilding if you know there’s a rich world in the making for 16+ years. Any DM can relate to the feeling of pride from building a fantastic world, and the excitement of going back. 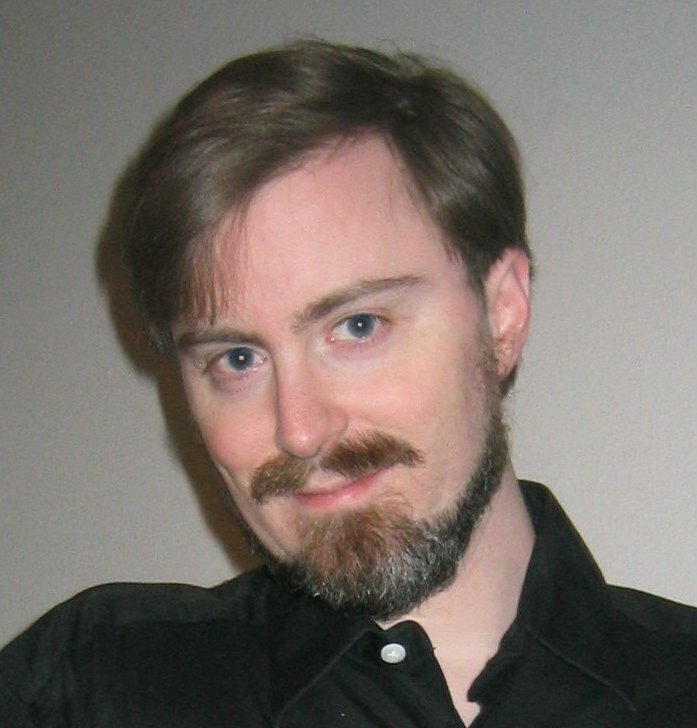 Keith’s original submission of Eberron was a dark fantasy world with creative pop-culture themes. Keith describes this world as a “Lord of the Rings meets Indiana Jones with a side of the Maltese Falcon”. Though the majority of this world appears steampunk at first glance, Eberron is best defined as machano-punk. A machano-punk based world contains machinery run by magical forces. In comparison to other fantasy worlds where magic is a rarity or misunderstood, Eberron displays a society that has embraced daily magic to run and progress a city. 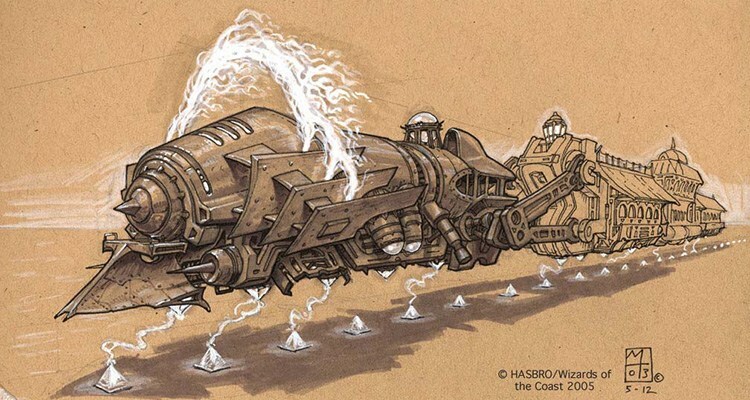 For example, the major cities in Khorvaire are all connected by a magical train called the “Lightning Rail”. Funny enough, this magical train doesn’t run off of any rail, at all! The “Lightning Rail” is powered by a line of magical conductor stones. The train produces a fierce crackle of electricity when it passes over these conductor stones. As progressive as this new world may seem, you will soon find out that Eberron is plagued by the previous war. At the beginning of this campaign, your players are welcomed on their journey with a dim start. All characters start with some form of financial debt to display the struggle everyone is facing to slowly rebuild. The city itself is still rebuilding from the war, and the aftermath weighs heavily on everyone. To further demonstrate the weight bearing on this community, each character tart with a different “regrets” weighing on their mind. Be mindful on new and interactive ways to help your fellow players set the scene. Also, it’s fun to get into the theme of a new campaign by setting the mood. Take time to assess your real life environment so your campaign group can easily transition into the world of Eberron. I suggest leaning into a lightning theme since the train-system is a popular selling point among players. While their characters are exploring the city, press play on youtube playlists to replicate the sounds of the train in the background. To add to the electric arcane aesthetic, try sticking to a blue and yellow colored theme throughout the campaign. 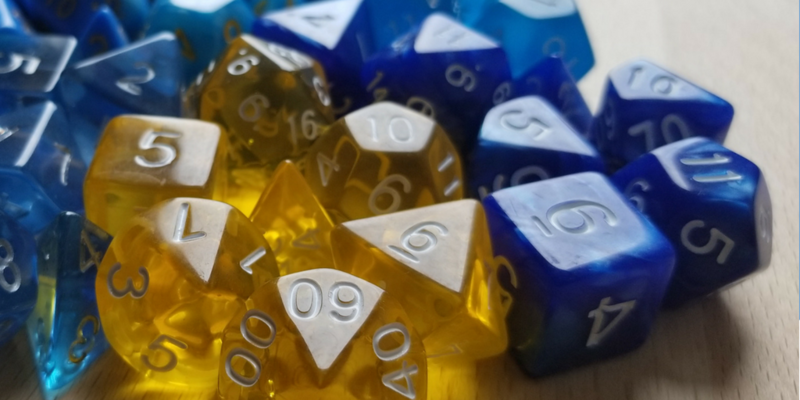 If you have players who frequently forget their dice, have blue and yellow dice ready to hand out. If you enjoy making specialty drinks and food for your group, I highly suggest this electric lemonade recipe. Blues and yellows add fun electric tone, though you don’t want to add too many bright yellows. Remember, Eberron is plagued by a previous war, so you don’t want your environment to be too visually bright and cheerful. 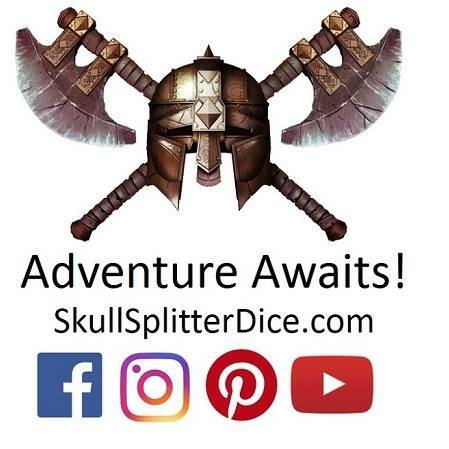 To any DM’s who are eager-beavers to write something truly unique and exciting, also check out these optional rules by Keith Baker. Before his recent re-publishing of Eberron, Keith posted these rules to his blog for anyone wanting to play his envisioned campaign. Now, he's re-starting a D&D podcast called Have Dice Will Travel where "interesting groups of people" play Eberron. Check back here to see his newest of episodes once he restarts the show.